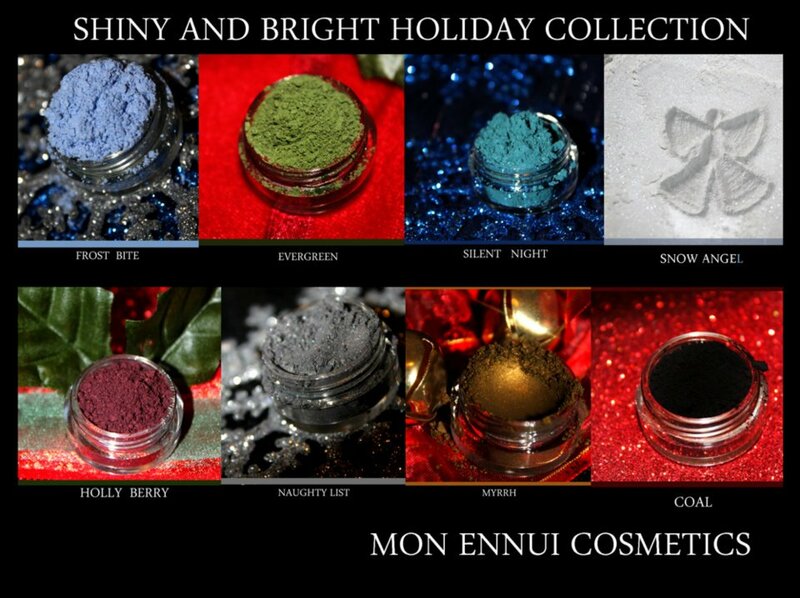 This is Mon Ennui Cosmetics’ New Holiday Collection, this includes Coal a matte black, Evergreen a matte forest green, Frost Bite a warm pale blue, Holly Berry a metallic wine, Myrrh a metallic smokey gold, Naughty List a sheer metallic pewter, Silent Night a cool teal blue with color shifting shimmer, and Snow Angel a frost glittery white. They all look different and I love the fact that although they are a collection, it involves different types of colors and finishes like sheer, metallic and matte. I personally think Myrrh is a lovely color and I would love to pick up that one.